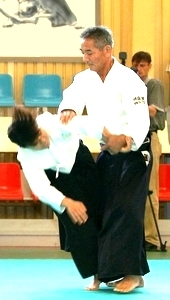 Aikido techniques are developed to use the whole force of attackers. This means that the stronger an attacker’s force, the easier we can handle the attacker.There is no offensive technique in Aikido because to attack means to be defeated in spirit. Aikido is based on the principle of ultimate nonresistance so that any attacker will feel no force from a person who has mastered Aikido. There are no enemies in Aikido; even if there is an opponent, a person who practices Aikido should freely handle the opponent as a part of his/her own body. Introduction of Mitsuru Sobue Shihan. 1964 Joins the Aikido club of the Aichi Graduate Studies University (Aichi Gakuin Daigaku). 1965 Receives the first dan certification from founder Morihei Ueshiba. Becomes the third club public relations officer. Participates in the composition of the statutes of the association of university Aikido clubs of the Chubu region. Mitsunari Kanai Shihan, sent by the Hombu Dojo to teach in Nagoya, departs for the United States. 1966 Receives the second dan from founder Morihei Ueshiba. After finishing his studies, continues training in the Aikikai section of Nagoya and at the Nagoya YMCA, as well as at the Aikido club of the Asahi Shinbun newspaper. Kazuo Chiba Shihan, sent by the Hombu Dojo to teach in Nagoya, departs for England. Sobue Shihan then receives training from Norihiko Ichihashi Shihan and Nobuyuki Watanabe Shihan, come to Nagoya as replacement. 1969 Receives the third dan of the 2nd Doshu Kishomaru Ueshiba. Is put in charge of teaching in the Aikikai section of Nagoya and at the Nagoya YMCA. 1979 Receives the fourth dan of the 2nd Doshu Kishomaru Ueshiba. 1982 He starts to receives instruction from Seigo Yamaguchi until the death of the latter. He trains at the University of Nagoya, Meiji University, at the Nerima Sports Center, and at the Zoshukan of Shibuya. 1984 Becomes co-administrator of the Aikikai section of Nagoya. Presides over the annual black belt gathering. 1985 Receives the fifth dan of the 2nd Doshu Kishomaru Ueshiba. 1987 Studies the “Yagyuu Shinkage ryu” sword style with the 21st soke, Nobuharu Yagyuu. 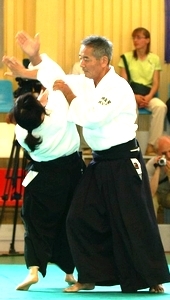 1990 In order to study the techniques of Seigo Yamaguchi Shihan in Nagoya, he creates the “Meirin-Juku” association there of which he is the leader. The training takes place at the Tsuyuhashi sports center. 1993 Recieves the sixth dan of the 2nd Doshu Kishomaru Ueshiba. 1994 Participates in a seminar specially organized for the 70th birthday of Seigo Yamaguchi Shihan. 1996 After having taught at the Hombu Dojo until his final days, Seigo Yamaguchi Shihan dies of a chronic illness that suddenly escalates. The same year Sobue Shihan invites Seishiro Endo Shihan to Nagoya for a research seminar to be organized every year from that point on. 1998 Is put in charge of the Aikido section of the Open College of the junior college Nagoya Bunka Tanki Daigaku, where he teaches for two years. 1998 In August he opens his “Meirin-Juku Dojo” at 3-8-8 Kanayama, Nakaku, Nagoya, which he still leads, with the objective of deepening the study of the techniques of Seigo Yamaguchi Shihan. 2005 Receives the seventh dan of the 3rd Doshu Moriteru Ueshiba. -Aikido is practiced by unifying mind and body, and becoming one with the partner.The aim of Aikido is not to harm others, but to awaken the natural abilities of the human body. -Meirin-juku Dojo wasestablished in October, 1990 with members whos aim was to highten each other through practice. Trainings were initially held at the Tsuyuhashi Sports Center, after which through the help and support of many, the current Kanayama dojo was established on August, 1998. – In Meirin-juku Dojo, a nonprofit group of pursuing Aikido, all members should practice Aikido techniques to improve each other’s hability.A beginner is expected to start by learning the forms and names of the basic Aikido techniques recommended by Aikido Hombu Dojo. Becoming skilled in Ukemi (breakfall), he/she will shift to a stage of pursuing the meaning of Aikido with the attitude “Respect all others as teachers.” We should practice Aikido with the spirit “If I failed yesterday, I can overcome and succeed today,” and consider the meaning of each technique. During each lesson, we should do Aikido with a positive feeling. – A person of high school age or older can be a student of the dojo and is required to wear an Aikido Gi (Judo or Karate Gis are also acceptable). All members should buy Accident Insurance every April. Any injury or accident during practice is the responsibility of each member. All members should do warming-up exercise before to start the practice. If any trouble occurs during practice, it must be cleared by the involved members. – All members should pay their membership fees at least one month in advance. If a member fails to pay his/her membership fees for two months or more without notice, he/she will be removed from the member’s list. When a member gives a leave of absence notice, the membership fee will be reduced to 500 yen per month. – To improve the practice environment, all members are recommended to clean inside and outside the dojo after practice. Since the dojo is located in a densely built-up area, keep quiet before and after practice. The dojo has no parking lot so all members and visitors are recommended to use public transportation. Sundays due to other practice responsibilities of the headmaster. the headmaster for the bank account. The payment already received will not be returned for any reasons except mistake. Q1: How can I observe the practice in Meirin-Jyuku Dojo? Class. See the Practice Schedule and Map on the Home Page and visit the dojo at ease. convenient to answer your questions and the like. Q2: What is a practice observation? A: Observing the practice in a dojo is also a very important way of practicing Aikido. Q3: What is a dojo? permission from the teacher after beginning a practice. In other words, Meirin-Jyuku Dojo is a place for practicing Aikido not only enjoying it as a sport. Q4: How can I select a good dojo? than merely practicing to select the most suitable dojo for you by observing various dojos. A: Acquiring the spirit and techniques of Aikido requires serious practices under a reliable teacher. you can be proud of and rely on. Q6: What kind of dojo is Meirin-Jyuku? sensitivity, which means that there is no fruit from only paying membership fees. from members to take part in managing the dojo and practicing together. Q8:l What is practicing as a visitor? and the rules in　Meirin-Jyuku Dojo. Q9: Are there any differences between the Beginner and Ordinary Classes? A: In the Beginner Class, a member should start learning the basic attitude and body movements. members cannot join the class from the beginning due to their working condition or the like. Q10: What kind of practice is carried out in the Advanced Class? it is required to pay the extra fee in addition except for students. Q11: Please explain the membership fee? paying membership fees remained. Submit the notice of recess or withdrawal without fail. For a long-term recess, the advanced notice can reduce the membership fee to \500 a month. If the membership becomes invalid, no support will be given from the dojo. Q12: How the dojo copes with any injury during practice? become no object of paperwork. Q14: Can I practice Aikido wearing glasses? Q15: Is there any entry qualifications in Meirin-Jyuku Dojo? member when he/she can practice with ordinary class members without undue stress. Q16: Can I make a school boy/girl learn Aikido? wait until we have the Schoolchildren Class. Q17: What attitudes are to be held during practice? overcome and succeed today” unveiling one’s sensitivity. After all, Aikido movements consist of just “sitting, standing, and walking appropriately”. Q18: Is there no practice on national holidays? A: Except the beginning and the end of the year, there is no break in the practice throughout. Q19: Please teach me how to hold up a hakama. learn the formal holding method referring How To Hold a Hakama. Q20: Can I get any membership card or certificate of registration from the dojo? membership card to the certificate of 5th Kyu when a member passes. Q21: Are there any other precautions? A1: All activities concerning religions and politics are prohibited in the dojo.